Citation BRASSIA CAUDATA (Linnaeus) Lindley, Bot. Reg. 10: pl. 832. 1824. 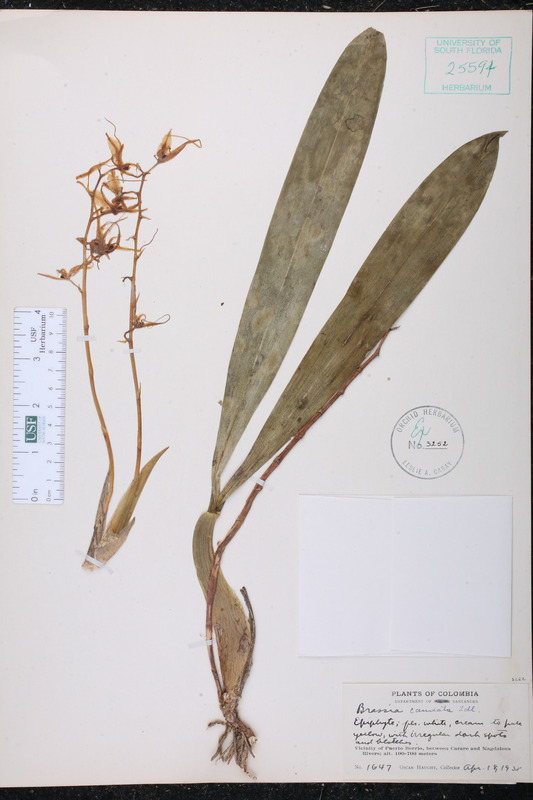 Basionym: Epidendrum caudatum Linnaeus 1759. Type: Without data (lectotype: Plumier, in Burman f., Pl. Amer. t. 177. 1758). 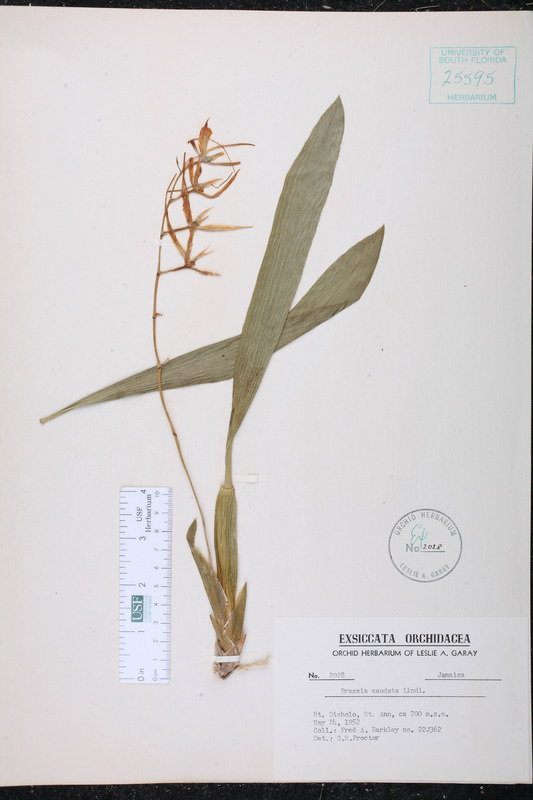 Lectotypified by McLeish et al., Native Orchids Belize 120. 1995. Epidendrum caudatum Epidendrum caudatum Linnaeus, Syst. Nat., ed. 10. 1246. 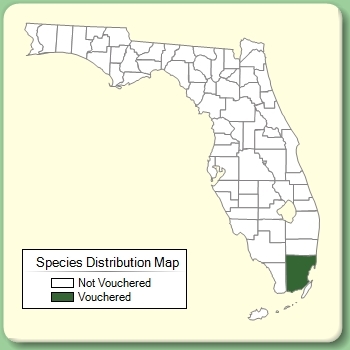 1759. TYPE: Without data (lectotype: Plumier, in Burman f., Pl. Amer. t. 177. 1758). 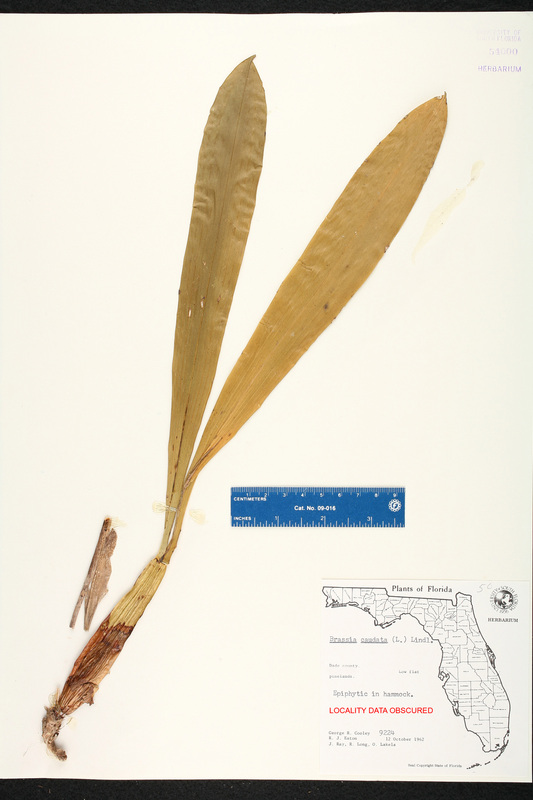 Lectotypified by McLeish et al., Native Orchids Belize 120. 1995. Malaxis caudata Malaxis caudata (Linnaeus) Willdenow, Sp. Pl. 4: 93. 1805. BASIONYM: Epidendrum caudatum Linnaeus 1759. 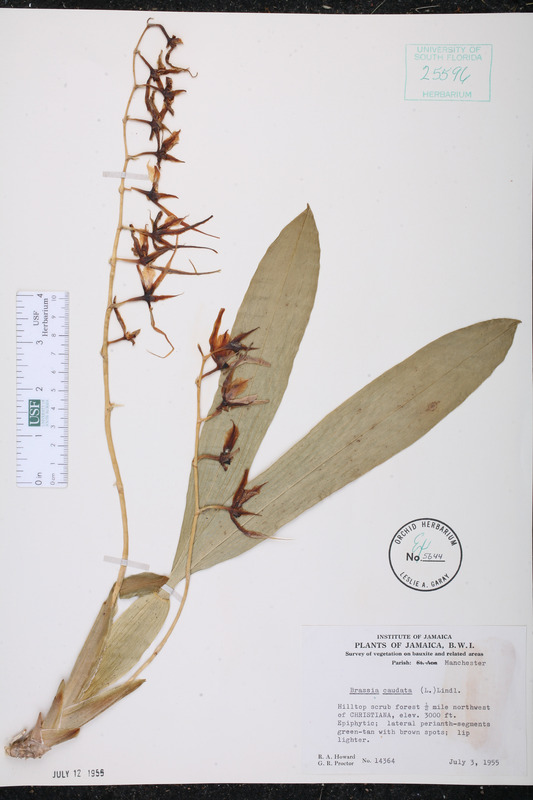 Oncidium caudatum Oncidium caudatum (Linnaeus) Reichenbach f., Ann. Bot. Syst. 6: 766. 1863. BASIONYM: Epidendrum caudatum Linnaeus 1759. Brassia caudata var. hieroglyphica Brassia caudata (Linnaeus) Lindley, var. hieroglyphica Reichenbach f., Ill. Hort. 28: 20, pl. 410. 1881. Brassia lewisii Brassia lewisii Rolfe, Orchid Rev. 1: 199. 1893. Brassia longissima var. minor Brassia longissima (Reichenbach f.) Schlechter, var. minor Schlechter, Repert. Spec. Nov. Regni Veg. Beih. 17: 80. 1922. 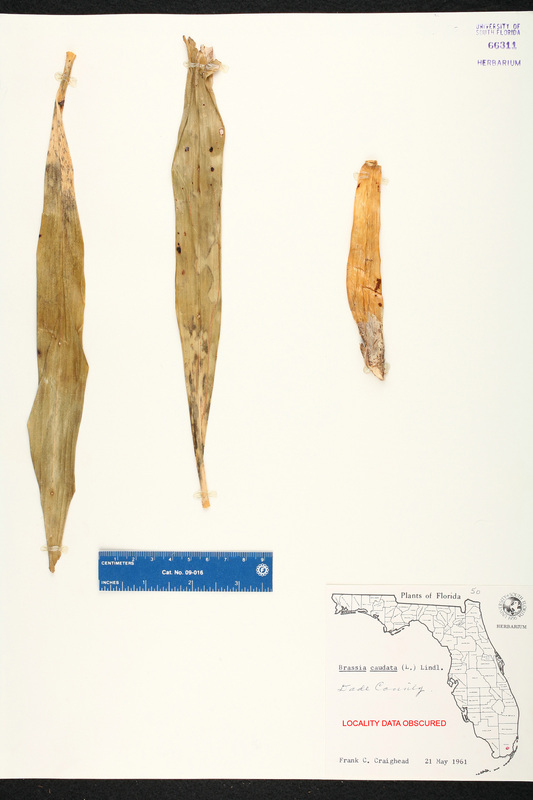 TYPE: PANAMA: Panama: Near Panama City, s.d., Powell 72 (holotype: B?). USA Florida Miami-Dade Co. 21 May 1961 F. C. Craighead s.n.